There are many drivers out there who have a furry kid on board these days, and many more that are considering getting one. Having a pet along for the ride can be a very rewarding experience. Neither of us would ever leave home without ours! That being said, you need to be a responsible pet parent, taking all necessary precautions to protect your furry little sidekick. Like a good boy (or girl) scout, be prepared! First of all, if you drive for a company, find out their pet policy since some companies do not allow pets in the truck. Be sure to get your pet vaccinated against all diseases required by law, as well as vaccinated against anything that your pet may be exposed to simply by location. There are parts of the country where certain things may not be an issue. For example, I live in Arizona where Dixie would not need to be vaccinated against the Leptospirosis virus, but since we travel and spend a lot of time in upstate New York in rural wooded areas, my vet advised that we needed to do it. It is very important that your vet understands your pet is going to be all over the map, literally, so that they can protect accordingly. Keep copies of vaccination and license records with you in the truck, making sure they are always up to date. You may also want to have your pet micro-chipped by your vet for your pets’ safety, as well as for your own peace of mind. Keep these copies, along with a photo of your pet, within easy reach of the drivers seat in case of emergency. Putting them in your permit book works well and keeps them safe. If you are involved in an accident you can provide first responders with vital information immediately to help them treat and or locate your pet right away. While rolling, I have gotten into the practice of tethering my dog to my seat belt. It’s a simple task, I just attach a 6 foot leash to her collar and loop the other end over the hard part of my seat belt before buckling it up. This gives her plenty of room to move around, get a drink, etc., but still keeps her close and keeps her from bolting ‘just in case’. Always leash your pet. Just because your dog is friendly does not mean every dog is friendly! Carry a plastic bag to pick up after your pet, especially when you are at a customer’s dock. Not all of these places even allow you to walk your animals while there, so when they do it is important to respect them and pick up after your pet. Carry plenty of supplies for your pet. If your pet needs special food or medication, make sure you have enough before leaving home or make arrangements to get it while on the road. Heartgard and flea and tick protection are both monthly, year-round applications when traveling nationally, so keep these in stock as well. We carry bottled water for our dogs so that we can be sure there is consistency in what they drink. This way we are sure there aren’t any gastric problems for our ‘babies’. 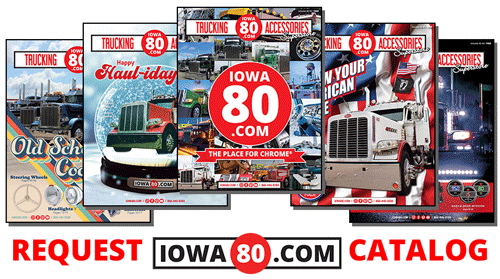 Iowa 80 offers a pet wash, the Dog-O-Mat, so any time you can get your truck washed Rover can get cleaned up too! This do-it-yourself facility is out in front of the Truckomat and works really well. It’s a separate building from the Truckomat that is specially built just for you and Fido. It is a protected and clean facility for drivers and their fur babies! Iowa80.com’s chrome dog, Andy, loves to sniff out doggone good deals for you. Exercise is always difficult for us when we drive, but having a dog on-board helps motivate us to move. We have to get out and walk when we have a dog, and it’s good for both of us. Some truck stops now even have walking paths. If you use these, please be sure to clean up after your dog so the privilege is not lost to others because of a few. Last of all, keep all food (dog and people) out of reach from your pet or behind latched doors, and empty the garbage often. This can keep you from having to hunt an emergency veterinarian clinic someday, I promise! Although there is work involved, having these furry little critters with us have far greater rewards than we could ever explain.